If you are thinking about what you can do to help keep our world a better and safer place to live, California Style Sailing Lessons will put you on the path to competitive sailing, big sailboat cruising adventures or heading off on blue water sailing school passages without carbon emissions. Learn more about our wind sailing lessons below. What are California Style Sailing Lessons? California Style Sailing Schools provide sailing lessons in challenging and calm conditions, clean and ecologically friendly settings, and on vessels that leave behind no or very little carbon footprint. Just like Offshore Sailing School does at its Florida Sailing Schools and British Virgin Islands Sailing Schools too. Sailing is a wind-driven activity. While an engine may be required by harbor officials to get in and out of those confined areas, as soon as an Offshore Sailing School vessel is past any harbor restrictions, the engine (if there is one aboard) is shut down and California Style Sailing Lessons commence. If you believe that we must be good stewards of our environment, and our world, you should participate in California Style Sailing lessons at Offshore Sailing School and learn to travel under sail power alone. If you have dreams of taking off on a blue water sailing school adventure, you should participate in California Style sailing lessons at Offshore Sailing School and learn how to ultimately handle a blue water sailing yacht safely, comfortably and confidently. If you’d rather be out on the water, with the wind in your hair, and the quiet propulsion of wind in your sails as opposed to noisy engines – then California style sailing lessons at Offshore Sailing School are definitely for you! And if you have a competitive nature, if you like to win but not at all costs, especially when it comes to our environment, then California Style Sailboat Racing Lessons at Offshore Sailing School are absolutely for you. Stewards of Our Climate for More than Fifty Years! 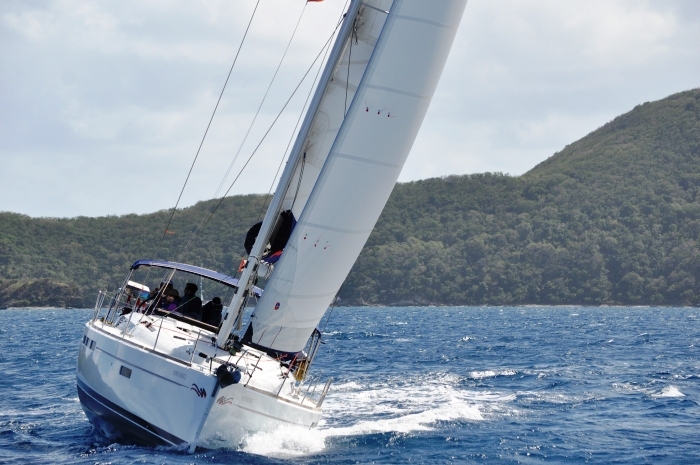 Offshore Sailing School is entering its 55th year of producing happy, dedicated sailing enthusiasts. More than 150,000 adults – individuals, couples, families and their children – now spend their free time on sailboats sailing, cruising and racing because they learned in one of Offshore Sailing Schools’ California style sailing lessons programs. Leave your car in your garage. Set your sails on your own boat, or a chartered yacht and feel the clean freedom only wind power can provide. Our wind sailing lessons can help you get that! Plan to purchase a comfortable cruising yacht rather than a big motor coach and keep carbon emissions to a bare minimum. Cross the starting line on a sleek keelboat with just the wind driving you ahead of the fleet. Finish that day of competitive sailboat racing, with no carbon footprint, and only the noise of high fives and yelps of joy! Now that’s what Offshore Sailing School’s California Style Sailing Lessons Delivers!